Oslo: Aschehoug & Co, 1994. This is the Norwegian edition of Coyote Waits, published in 1994 by H. Aschehoug & Co. in Oslo, Norway. The Norwegian translation is by Atle Bjørge and the cover illustration is by Bernard Blatch. The front cover of this edition displays the author's name and book title in metallic gold with a red drop shadow, on a white background. In the center, a red diamond with a black border contains a drawing of a stone formation in the shape of a human hand extending out of the ground. Across the palm just below the fingers, a word is suggested in white against the dark stone. At the top right front, there is a hole punched completely through the book. Curving around the hole, both above and below it, is the word "Kaliber," the publisher's crime/suspense series name. On the back cover, the author's name is printed in large red type above a brief author biography and synopsis of the novel. The bar code is printed at the bottom of the back cover. 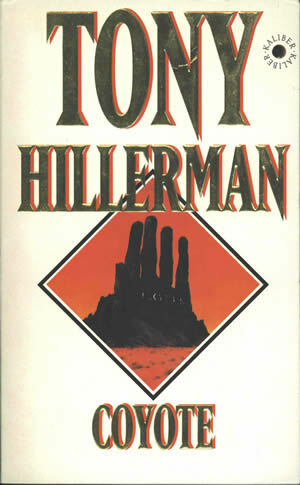 On the spine, the author's name is printed in red, the book title in black, and the series logo of a black dot with "Kaliber" curving around both above and below is printed at the bottom in black. Binding: Paper covers. The author's name, book title, and series logo are printed on the spine.